Gedeo Resin Colour Discovery Set is a two component epoxy system (resin and hardener) which gives a surprising re-production of castings, inclusions, bottoms of platters, jewellery creations and coatings. When decorating it can also be used as a protective varnish. 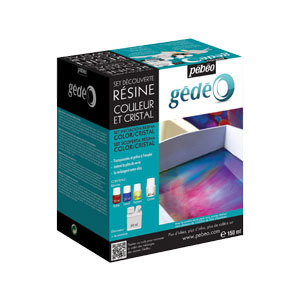 The Gedeo Resin Colour Discovery Set is a NEW crystal resin kit, including three colours to mix with the resin.